Please don't poo in our ool. 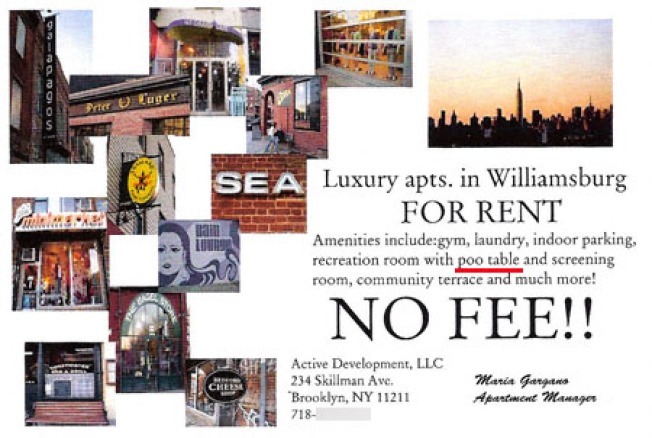 Now we lament the thankless task of the downtrodden copy editor as much as the next guy, but this gaffe is too good to pass over, if only for the all around awfulness this real estate come-on had going for it even before it hilariously dropped the "L" from the pool table on its amenities list. It seems to shout: "Live in happening Williamsburg, you crazy kids, and just look at all the cool stuff you might have seen on 'Gossip Girl' one time: Tai Thai, The Bagel Store, Peter Luger! Minimarket! Galapagos!" Wait. No, that's closed. You'll have to go to Dumbo for that, but still, "You'll live in the lap of luxury. A rec room, gym, screening room, and poo table!" This gem comes courtesy of Newyorkshitty.com, where Miss Heather quips that up in Greenpoint, "the humble sidewalks have to suffice."